Welcome to ScriboCreative.com where we publish books that make you think and smile. 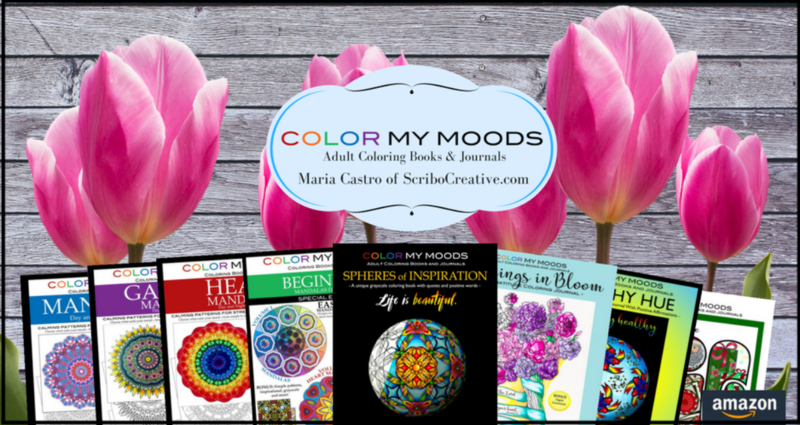 We’re starting off our creative journey with artist and indie publisher Maria Castro’s Color My Moods Adult Coloring Books and Journals series. Our coloring books are available in both paperback and PDF. Check out the previews and links to all of our adult coloring books and journals here: https://www.scribocreative.com/products/. If you want to be the first to know about our latest coloring books and journals, sign up for our enews. We also give our loyal enews subscribers, exclusive freebies, discounts and coloring tips. We hope you find coloring inspiration as you browse our site. Connect with us and as always, we wish you a good MOOD colorful day! Enews please! I want it all — freebies, exclusive discounts, coloring tips, new product previews, giveaway alerts, challenge announcements, and other relevant marketing information. New Scribo Creative product announcements only (which may include Color My Moods, COco Blank Books and Journals, and future products). I’m aware that I might be missing out on deals and other information included in the Enews. You can change your mind at any time by clicking the unsubscribe link in the footer of any email you receive from us, or by contacting us at info@scribocreative.com. We will treat your information with respect. For more information about our privacy practices please visit our website. By clicking below, you agree that we may process your information in accordance with these terms.